Psst! Have You Seen My Chicken? Ten years ago, if someone told me I would one day own chickens, I would have questioned that person's sanity. Five years ago, if a friend called me “earthy,” I would have been seriously offended. Six months ago, if I knew how much pleasure chickens could bring a family, we would have gotten them sooner. 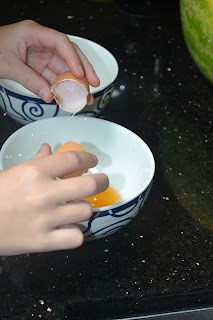 One month ago, if I knew how many egg cartons would be lining the shelves of the refrigerator, I would have begun stockpiling egg recipes. Yesterday, if I had known I would spend two panicked hours searching the forest and neighbors' yards for a missing hen, I would have stayed in bed. Who knows what adventures life will provide? 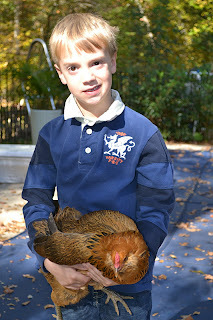 And who knew that adding chickens to our menagerie would be such a rush (in mostly a good way)? Our chicken adventure began clandestinely. We live in a subdivision. With a homeowners' association, albeit a fairly lax one. Our property is just under an acre, includes an extensive forest and backs up to a river. Our HOA doesn't have rules against chickens—it just doesn't mention chickens. Still, we feared that by asking permission, there might soon be rules incorporated into the bylaws. Plus, we have no intention of adding a rooster to the flock, processing chickens (the horror—they have names! ), nor allowing them unlimited free ranging throughout the neighborhood. They free range, but within a fenced-in area on our property. Honestly, these girls are pets. Pets with benefits. Pets who make breakfast. Pets who teach. 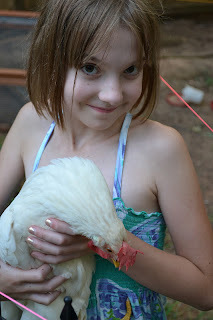 Kiki, our chicken mama, is learning amazing lessons. From the research she did to decide which breeds would be best for egg production to the first home she created for them—with rules decorating their box (“No pecking each other! No pooping outside the box! 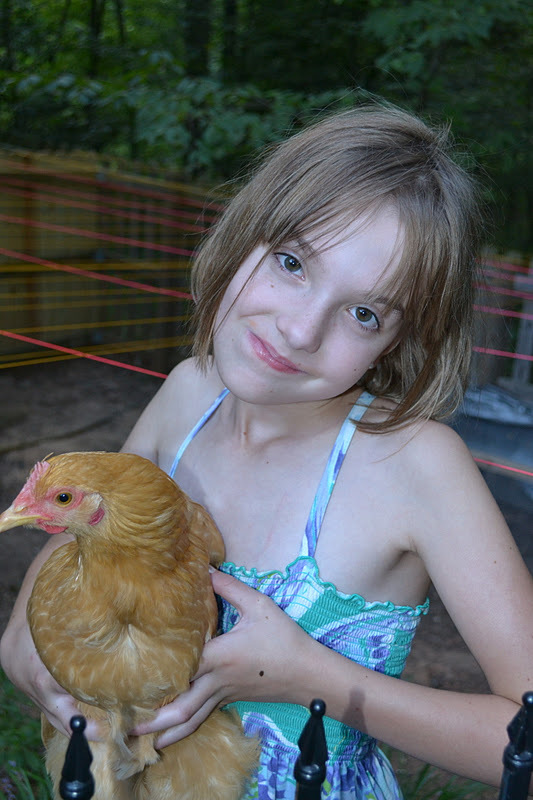 Bedtime is 8 p.m.”), she is an incredibly responsible chicken owner. As with any new pet, it's natural to worry that the excitement will wear off, and Mom and Dad will be relegated to chicken detail. After two dogs, two cats, two guinea pigs, a multitude of fish, a snake hidden in her tree house, as well as injured wild animals she helped nurse back to health, I didn't think we had much to fear about her losing interest. Still, at 6:15 a.m., I always feel a little sorry for Kiki, especially now that it's still dark outside when she wakes up. Honestly, I wouldn't have been a good chicken mama when I was Kristen's age. Then again, I was never chicken-obsessed like our girlie is. I often wonder what her teachers think about her chicken-brain...because she constantly thinks and talks about chickens. Her new endeavor? A chicken-based science fair project. As horrific as it was for Clue to become a dog toy for a moment, we were so thankful Kristen was there—because she saved Clue. After losing many feathers and having to spend some time in a hastily erected “chicken hospital” downstairs so that she could heal, Clue is fine. Kristen and I were traumatized, however. 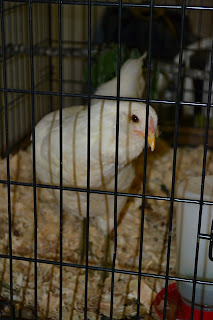 By the way, do you have any idea how smelly a chicken kept in a dog kennel in a basement can be? You don't want to experience it. I promise. A missing hen would be traumatic. Luckily, I didn't see feathers on the ground—neither in the forest (which might have indicated a hawk attack) nor in our dogs' area. The race was on to find Roxanne before Kristen got off the school bus. I walked down our street, shaking a bag of scratch. So, I did what any mom would do: I e-mailed Michael's piano teacher, explaining that we needed to cancel his lesson because we were searching for a missing chicken. I wonder if she's ever heard that excuse before? Time was running out—Mikey's bus arrives 30 minutes before Kristen gets home. I grabbed his hand, told him we weren't going to piano (“YEEES!”), and took him into the forest with me to continue our search. “I hear flapping!” Oops, sorry Mikey, that was me, shaking the feed bag. Up and down the forest, through the neighbor's yards, and then we tried the novel idea of being still and quiet. Did you know how incredibly loud and distressed a chicken can become when she wants to lay an egg? Mikey and I took off to our front yard, and there, in the woods between our yard and the neighbor's, paced Roxanne. I was unbelievably happy to see that naughty girl. Fortunately, our hens are extremely tame and used to cuddles and hugs. Mikey scooped her up, I gave her a handful of scratch, and he carried her back to her sisters. With 10 minutes to spare before chicken-mama came home. Several things became clear to me yesterday. First, it's impossible to keep secret chickens in your backyard. I'm pretty sure our neighbors have heard our girls before, but this was the first time I was really worried about inconveniencing them. I mean, truly—what if they found a chicken in their pool or in their dog's mouth? Not a pleasant thought. While we want to have our chickens free ranging in the area behind the pool—and we have installed a maze of string above the area to keep them contained—we obviously need to find a different solution. This isn't the first time a hen escaped, but they typically stay along the exterior of the fence, desperate to get back to their flock. Roxanne, apparently, is more adventurous. But my clearest realization yesterday was this: I am not a farmer. I think I want a farm, but the reality of farming is far different that my idealized view. Our chickens are pets. They have names. And I was literally ill, thinking about how I would tell Kristen that one of her girls was gone. My dad's family were real farmers. Real farmers, struggling to feed a family post-depression. My dad used to tell me that he would cheer when a chicken got loose and killed by a car, because then they could have fried chicken for dinner. Have I mentioned that we've been unable to eat roasted chicken—or any chicken with bones—since we acquired the girls? Still, the benefits of our girls outweigh the stress of yesterday. 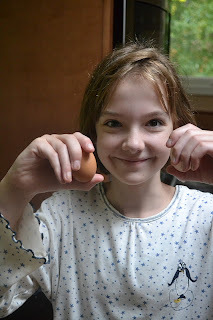 The first time Kristen found eggs in the nesting box was like Christmas and her birthday wrapped into one. She came running up the stairs, yelling for me, trembling. I thought something terrible happened to the girls. But no. The first two eggs! Such a proud chicken mama! Today, our girls are feasting on pumpkins. I'm hoping the post-Halloween treats make them all stay close to home. I'm incredibly paranoid about escaping chickens. I don't think my heart can handle the trauma. The girls are all laying now, with the exception of Risa. Kristen is organizing her egg business, lining up customers, with the hope of raising money for a horse. With six chickens, I'm happy to report that it will take her a very long time to raise money for a horse. Because, somehow, I don't think we can keep a secret horse in the backyard.